The Steam Summer Sale is now live, and you know what that means. You do know what that means, right? It means it's time to grit your teeth and get out your wallet. They've got 100 Daily Deals set to roll out, they've got eight-hour Flash Sales, and you can even vote for what goes on the cheapie block with the Community's Choice Voting Sales. A few examples: BioShock Infinite is $29.99, Hotline Miami is $2.49, Dragon Age: Origins Ultimate Edition is $8.99, Counter-Strike: Global Offensive is five bucks, Scribblenauts Unlimited is five bucks, Portal 2 is ten bucks, The Witcher 2 is ten bucks, Shadow Warrior Classic Redux is eight-fiddy - okay, that last one isn't a huge savings but it's an awesome shooter and not the sort of thing you're likely ever going to see in a new release. The first Community's Choice Sale begins in a little over six hours, meaning that you've got just less than that to cast your vote for Dishonored, Borderlands 2 or Far Cry 3. 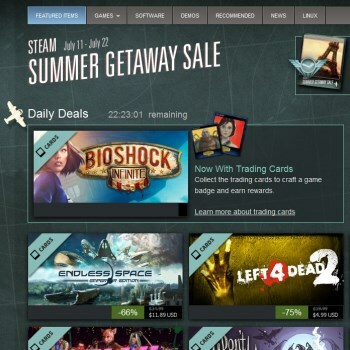 A lot of these games are also now offering Steam trading cards, and for those who care about such things a "special" Summer Getaway Badge is up for grabs as well. I could continue to prattle on about the prices (Farming Simulator 2013 is half-price!) but that's not really necessary, is it? All you need to know is that the the Steam Summer Sale is now live, it runs until July 22 and it's time to spend until it hurts. But have patience: Steam is getting hammered like a freshman frat boy, so you may have a little trouble getting around until things smooth out.